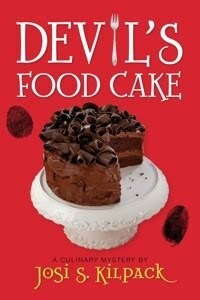 I finally made the time to read Devil's Food Cake the third in Josi Kilpack's culinary mystery series. Loved it. A terrific cozy mystery. I adore her heroine, Sadie Hoffmiller. My only problem with the story is the cover. As you can see, it's my weakness. The first weekend I had the book I baked devil's food cake. After eating three pieces I had to force the rest of the cake into my boys' mouths and hide the cover under other books. Besides the temptation to eat as you're reading, the series is wonderful. Lemon Tart is the first followed by English Trifle. Key Lime Pie (#4) was released in August so I'm a bit behind. If you can resist the recipes or aren't on a diet, I would highly recommend the entire series.